The Quelarc connector is used for portable and detachable electrical equipment in circuit breaking 30, 60, and 100 ampere, 600 VAC power. Quelarc plugs and receptacles are built to withstand the most severe operating conditions and have been proven by years of dependable service. They offer extra ordinary long-insulating paths that provide uninterrupted service in the presence of dampness or current carrying dust. The partitions between the male contacts increase the length of insulating surfaces to prevent arcing from pole to pole and from pole to ground. Compound circuit breaking arc chambers insure complete snuffing and cooling while the plug is still engaged with the receptacle housing. 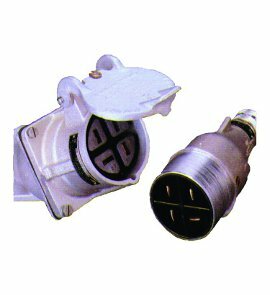 The many substantial construction features of this line of plugs and receptacles provide a safe operation.